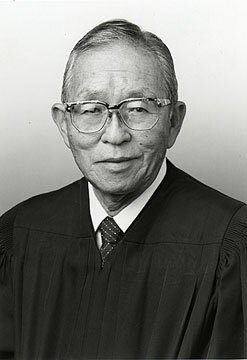 Retired Hawaii Supreme Court Justice Yoshimi Hayashi would point out that he was the only person who had served on the bench at all four levels of state courts. That wasn't his only "first." Hayashi was the first Japanese American named to the position of U.S. attorney when he was appointed in 1968 by President Lyndon B. Johnson. He was named the first chief judge of the state Intermediate Court of Appeals when it was created in 1980. "If you mentioned his achievements, he would change the subject," said Walter Kirimitsu, University of Hawaii general counsel. "He was always humble about it." Hayashi, 83, died Sunday in the Queen's Medical Center. He retired in 1992 after 10 years on the high court. His career as a judge began with an appointment to District Court in 1972. He served two years, followed by six years on the Circuit Court and two years on the appellate court. One of the generation of nisei soldiers who returned from World War II to become leaders in Hawaii, he worked in private law practice and at the city Corporation Counsel's Office before his appointment to federal prosecutor. "He had a very good legal mind ... very fair, precise and technical on matters he needed to be technical about," said retired Justice Frank Padgett, who served on the appellate and Supreme courts with Hayashi. "Hash was such a good person. We were friends and I'll miss him very much." Retired Circuit Judge Marie Milks recalled being called to Hayashi's chambers many times for a scolding about her conduct in court as public defender in felony cases. "He chewed me out when he thought I wasn't conducting myself in a respectful manner" -- for taking a haughty attitude with the opposing prosecutor, or for her treatment of a witness. "He threatened to throw me in jail once." She said his advice "helped me to develop, grow. Judges like Hayashi were seemingly hard on us. He was doing everything he could to make me better." Milks said when she was appointed judge, she asked Hayashi for his advice and his response was: "'Be kind to the new lawyers.' It was something that stuck with me, I thought I'd try to do that." Circuit Judge Patrick Border, who was assigned to Hayashi's court as a deputy city prosecutor, said: "He was an equal employment mentor and many are richer for the experience. When Judge Hayashi corrected you, you knew it was good thing, a badge of honor that he would take an interest in you." Kirimitsu said his longtime friend "was a mentor to me professionally and also personally, as a role model. He had a total dedication and passion for the law. He was a good family man, of the highest integrity." Hayashi was born in Honolulu in 1923. During the war, he served in the Army Military Intelligence Service in the Philippines and Japan. He graduated from the University of Hawaii with a sociology degree and earned a law degree from George Washington University. He is survived by his wife Eleanor S., son Scott K. and two grandchildren. Funeral services will be held at 6 p.m. May 12 at Hosoi Garden Mortuary. Friends may call after 5 p.m. The family suggests that aloha attire be worn.